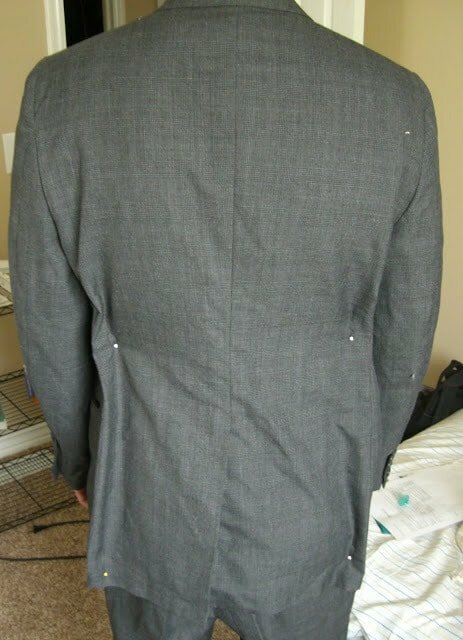 Here I’m going to tell you how to pin/mark a suit so that it can be altered. 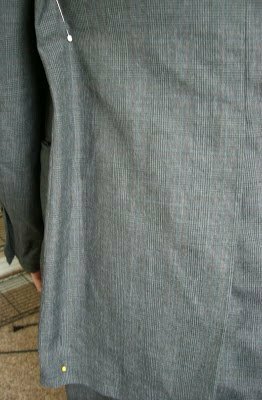 WARNING: what I’m about to teach you can only be done to suit coats with one center back vent that doesn’t have an obvious print, like a stark contrasting pinstripe. There is just too much to teach for all the kinds of suits there are. It gets pretty complicated. Since a single center back vent and basic pants are pretty common, I thought this would be best. Here is the picture where I’m marking the waist. I asked my husband to put the pants where he wants them to rest, and then I pulled it to the tightness he liked. I pinched out some fabric at the center back seam as you can see. I then mark it with chalk or safety pin it. (To sew this we take in the waist through the seat area and taper out to just before the inseam. Make sure then if this is done, the pockets will not be so close it looks like a uni-pocket.) A waist and seat are done to make the waist fit the man better. Now we move onto marking the suit jacket. Have the person button all the buttons for the whole jacket marking. Put your hand under the arm of the person your marking and run it down along their side until it stops at the waist/smallest area of the middle. . This next picture shows my hand sitting in the smallest area of my husbands middle. This is where the most amount of fabric will be taken in. I pinch out fabric here on both sides at the side back seam. Most suits have these seams so they can be altered. If it doesn’t have these seams, this is not the way to alter it. Not too much that the person can’t move, but enough to be fitting/flattering. 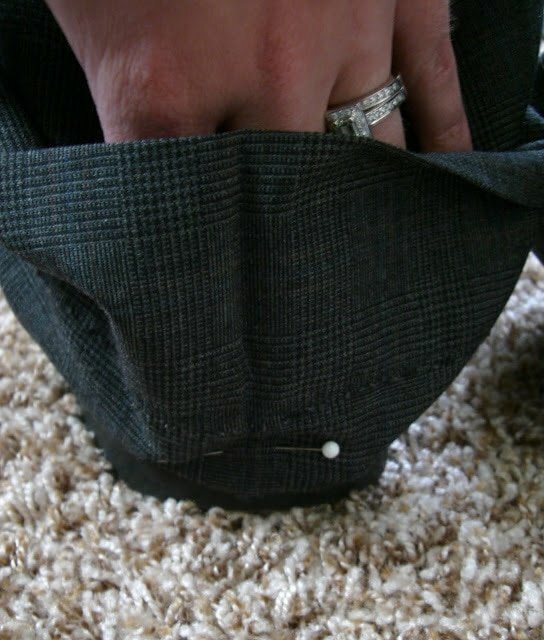 Then you pin at the hem of the jacket. You have to pin at the hem so that the jacket doesn’t flare out like a women’s jacket. Also, you don’t want to pin out too much at the hem to make the vent pull open. It’s just enough to make the jacket look nice. It’s nice to pin the vent closed then pin the sides so you see how much room you have. In the picture below, I have pinned twice on each side. don’t pin any higher then the waist because that seam has to taper to the underarm. Here’s a close-up of one side. If you can see, the hem mark is slightly smaller then the upper mark. They should be pretty similar though to get a good fit. I hope all of this makes sense! If you have any questions, feel free to email me! My email is on my contact page. This is so great! Finding patterns for male clothing is like pulling teeth. Thanks so much! This is great. What do you with the lining of the jacket? 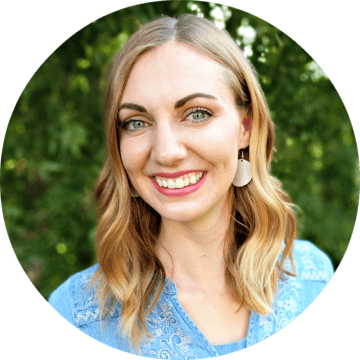 Do you turn it inside out and just sew through both layers? I gotta commend you on this one! Eek! It was a little confusing to me. But then again, I don't understand men's sizing either. I don't even under MY sizing yet! I definitely look up to you for tackling this! And I bet your husband is very happy with his new suit.